This past #GivingTuesday, I received a number of email blasts from nonprofits. I thought this one from one of my clients, the Alexandria, VA homeless shelter Carpenter’s Shelter, was the most catchy. If you’re unfamiliar with pop culture and current songs, you likely wouldn’t “get” this. Let me bring you up to speed. By now, you’ve probably heard of “selfies.” It’s when you take a photo of yourself, typically with your mobile phone. These photos are often used for posting on social media sites. Although I’ve seen all ages take selfies, it seems especially popular among younger people. On the other hand, you might know The Chainsmokers. They are a band who had hit dance song called #SELFIE. If you’ve never heard of The Chainsmokers, the Carpenter’s Shelter video will make more sense after you watch at least a bit of The Chainsmokers video. Incidentally, more than 267 million people have already watched the music video. Wow. 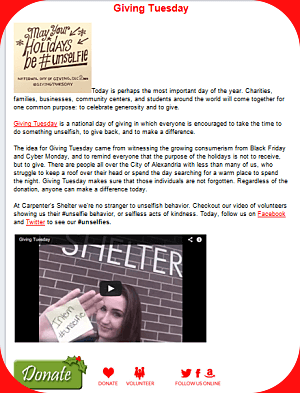 Carpenter’s Shelter’s video features #UNselfie. The #UNSELFIE was a campaign / theme adopted by a number of nonprofits this year. Even so, Carpenter’s Shelter was the only group I saw that had the approach of the video tied to the hit song. I suppose those who are unfamiliar with the hit song will assume that the background music of the Carpenter’s Shelter video is just catchy music. But for young professionals and others attune to current radio hits, they’ll understand the greater tie-in.